manufactured by Penske and us right here in the United States to the highest quality standards. All of our suspension products were track tested in very demanding conditions (please refer to our News page for latest track testing articles). After introducing our Penske coilover suspension for the IS-F and RCF, many of our customers were amazed at the improved handling and at the same time the comfort of this suspension. Many expect sport suspension to be harsher and uncomfortable, but they were surprised that our suspension is as comfortable (or some say, even more comfortable) than the OEM suspension. This page explains from a technical perspective our suspension performance and design principles that make this suspension the best suspension available for these cars. We also explain the major differences between our suspension tuning philosophy and design versus other suspension systems offered for the Lexus RCF, ISF, IS, and RC models (i.e. KW-V3, Ohlins R&T, and RSR coilovers). 1. Spring Rate Selection – Advantage of Using High Spring Rates. 2. True Rear Coilover Conversion for the 3rd generation Lexus IS/RC platform. 3. Advantages of Using Articulating Upper Spherical Bearing Top Mounts. 4. Advantages of Using Dual Springs vs. “Preloaded” Springs. 5. Penske 7500 Series shocks vs Ohlins R&T, KW V3, and other shocks — this is why they are superior. 6. Taking advantage of the Penske 7500 double independent compression & rebound adjustment to fine tune your handling. Linear and more predictable handling behavior. Figure 1 below is a good *estimate* of what happens in the IS/GS front suspension during cornering. We illustrate the amount of force that is required to compress the suspension (bump travel) for a sample 900lb spring (16kg), 560lb spring (10kg), and the bump stop. Looking at the curves, it is clear that the bump stop behaves very different compared to a spring – spring force increases linearly with deflection, while bump stops behave linearly at first, but as we approach the limit of travel, force required to compress the bump stop increases exponentially. The two vertical green dashed lines indicate how much compression of the front suspension we can expect under about 0.9g of cornering force and 750lbs of lateral weight transfer for the two spring choices. (Note: This is just a good estimate of the amount of increase in loading and displacement you would see on an RCF under about 0.9g cornering force, the precise calculation depends on knowing the exact weight of the car, front/rear weight distribution, center of gravity height, track width, motion ratio of the suspension, and shock inclination angle). If we take the spring force/deflection curve and combine it with the bump stop force/deflection curve, we get two curves for each spring/bump stop combination (curves “a” and “b”), as shown in Figure 2. (1) When the lateral weight transfer of 750lbs is applied, the suspension with the stiffer springs (curve “a”) behaves completely linearly as the combined spring/bump stop curve closely follows a linear behavior (line “c”). The increase in loading on the wheels is more predictable and the driver has a better feel for the behavior of the car. Even as more than 750lbs load is applied to the spring/bump combo, we only see a minor deviation from linear spring loading. 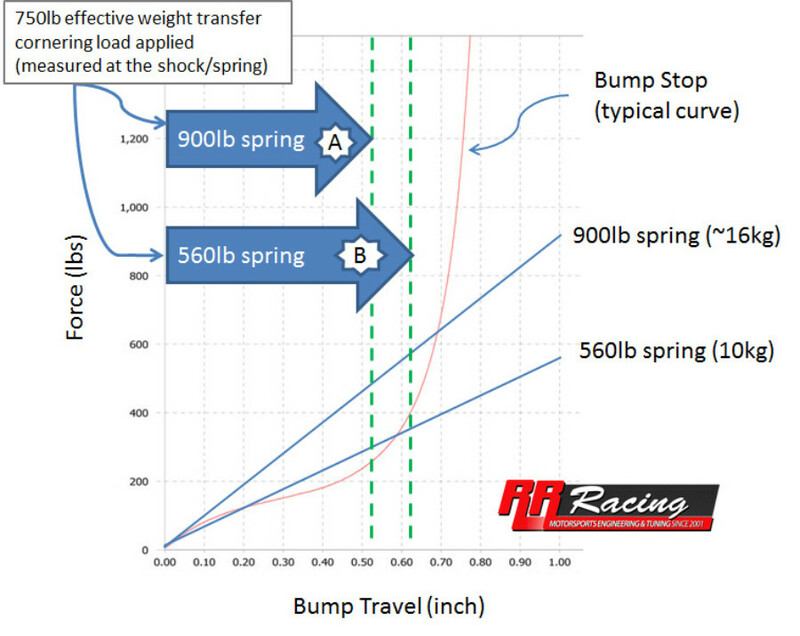 In the more softly spring suspension, you can see that after about 0.55″ of travel (see Figure 1), the force of the bump stops is starting to ramp up very quickly (beginning an exponential rather than linear ramp up). 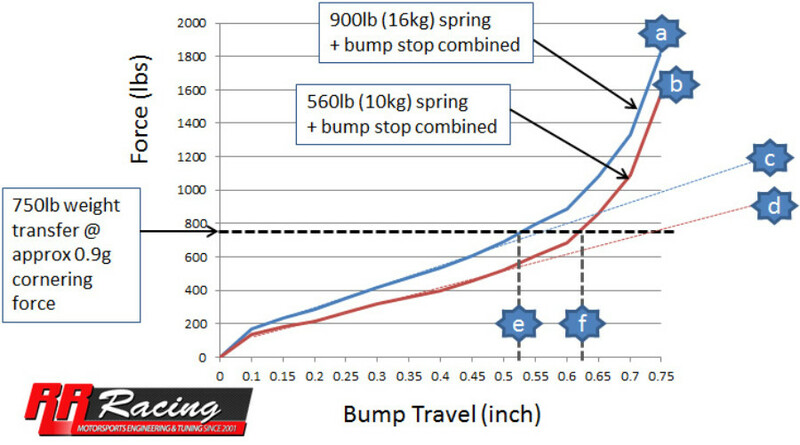 Any further increase in weight transfer and corning force results in non-linear bump travel and rapid non-linear increase in the effective spring rate (where the bump stop effectively takes over from the spring). This type of behavior typically induces severe at-the-limit understeer. (2) Comparing points “e” and “f” under similar weight transfer, you can see that the more softly sprung car will roll more (more bump travel for the applied load). The only way to reduce roll without using stiffer springs is by either increasing the bump stop stiffness, or using a larger roll bar. Unfortunately, increasing the bump stop stiffness will only make the situation described in above worse (more non-linear behavior). Likewise, increasing roll bar stiffness has negative consequences as well, such as reducing the independent movement of the suspension and inducing inside wheel lift. No, not necessarily. This is where careful consideration of wheel rates and spring frequencies come into play. But the real advantage we have in designing a suspension that is both track-worthy and comfortable is the quality of the shocks we use, our ability to tune shock valving, and the incredible resource we have with our close interaction with Penske race engineers. When you are traveling on a bumpy road, the shock is actually playing a more important role than the spring in terms of what you feel. Bumps on the road force the shock to travel at a high speed, due to the sudden impact of hitting something. Penske has done an amazing job at assisting us with shock valving. We achieved what is known as “digressive” rate curve, where the shock valving is set relatively soft at high shock travel speeds, making the ride over bumps very comfortable. Digressive valving also means that the shock valving at low shock speeds (low shock speeds occur when you change the direction of the car) is relatively hard, resulting in handling behavior that feels very responsive. There are other advantages to using the Penske 7500 shocks which we outline later in Part 5. The higher you go with spring rates, the more energy the shock must absorb. More energy equals more heat and more stress. So now you need to use better materials to make the shock, and machine everything to higher tolerances and higher quality control procedures. All these things are what make Penske Shocks more expensive (not to mention their proprietary shock pistons designs and internals which are the same as found on their uber-expensive full race shocks). Utilizing higher spring rates on a lower quality shock results in reduced shock life/durability and inability to control the rebound energy of the suspension, thereby resulting in a bouncy ride. There are other things that make our suspension better (other than the Penske shocks), such as our “True Rear Coilover” conversion, and the fact that we use an articulating upper spring perch to maintain co-axial spring loading of the shock absorber. 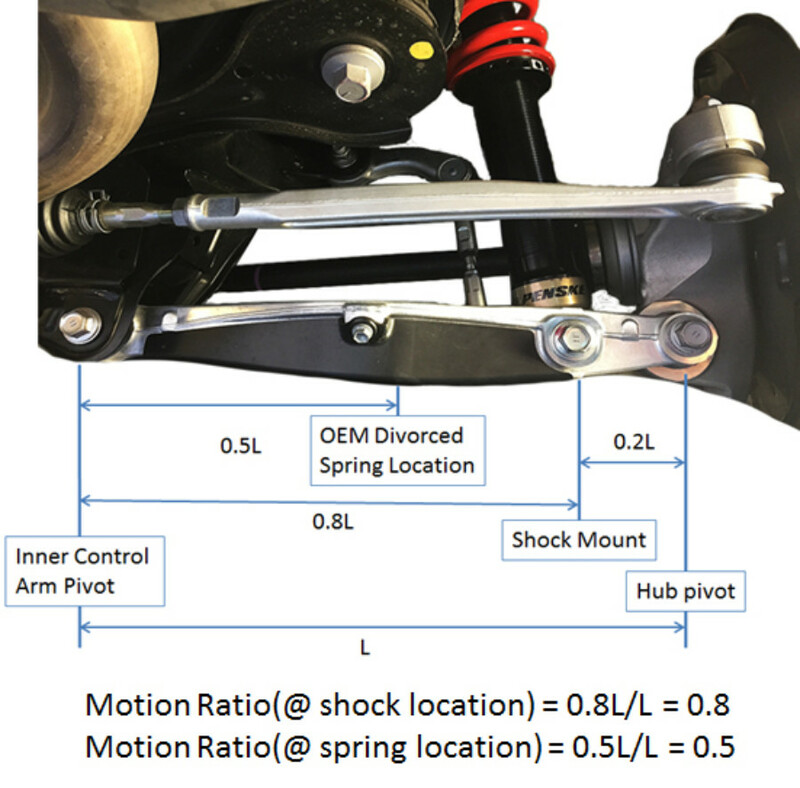 When Lexus re-designed the IS/GS/RC platform (3rd generation) they changed the rear suspension design from a rear coilover shock, to a divorced spring setup as shown in Figure 3 below. In a divorced spring setup, the spring no longer sits on the shock absorber, rather it is wedged between the lower control arm and the floor pan of the rear trunk. Manufacturers most likely do this out of space and noise considerations, but certainly not for performance! The main problem with a divorced spring rear suspension is the inability to adequately increase spring rates in the rear due to the reduced motion ratio of the inboard spring location. High spring rates are essential in taming the weight of a 3900lb Lexus RCF. 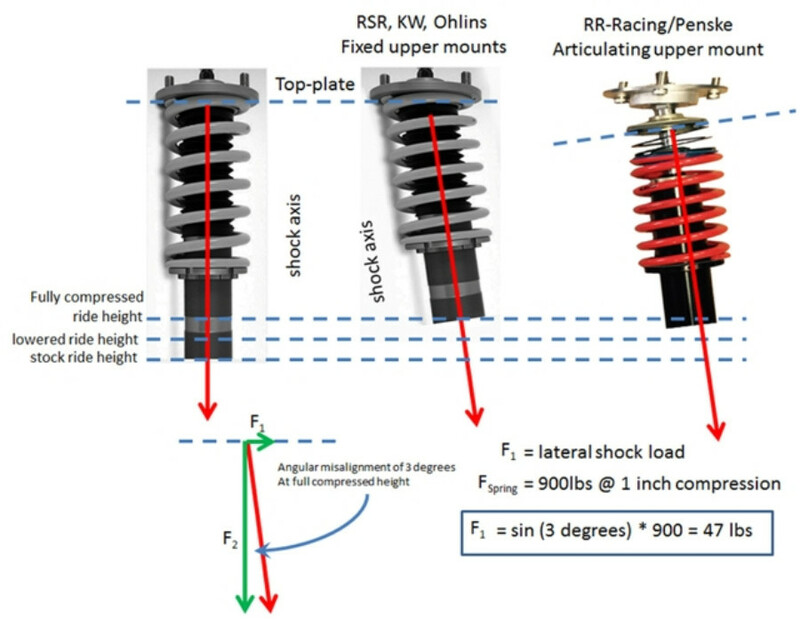 In Figure 4 we illustrate the motion ratios of the spring when it is placed at the “divorced” inboard location, versus at the shock absorber (“the True Rear Coilover”). Given our road and track testing on the RCF with our true rear coilovers, we found that a good spring rate choice for overall comfort and road/track performance was about 14kg at the rear shock absorber. If we plug into our motion ratio equation (see Figure 4), that would require a 22kg spring placed at the divorced spring location! To put that into perspective, one of our competitors makes an RCF “coilover” that utilizes 14kg rear divorced springs. Plugging into our motion ratio equation, we see that a 14kg divorced rear spring is equivalent to only 8.75kg at the shock absorber! That is nearly 40% softer then what we use on our coilover kit. While a 14kg divorced spring is stiffer than stock, it is inadequate and will result in a lowered suspension that relies on bump stops to reduce body roll. As we learned in Part 1, keeping the suspension off the bump stops maintains linear, predictable, and neutral handling behavior at the limit of tire adhesion. So why can’t you just use a 22kg spring at the divorced spring location? The problem becomes that in order to fit a spring with a rate that is so much higher than the stock spring, you have to make the spring much shorter in order to achieve lowering of the rear suspension. Problem is, when you shorten the springs, you also shorten the rear “droop” travel. Sufficient droop travel is essential in order to maintain stability over large bumps. Also, cars with insufficient droop travel tend to lift inside wheels during cornering, something that is not good for traction or stability. The other problem with shorter and stiffer springs is the high mismatch angle between the lower control arm and the spring, resulting in excessive bowing of the spring, and non-linear spring behavior. Spring bowing is much more problematic in very stiff springs compared to soft OEM springs. 3. Advantage of Using Articulating Upper Spherical Bearing Top-mounts and Lower Mounts. Another advantage of the RRRacing/Penske Coilover System is our top-plate design, which allows the spring to compress co-axially with respect to the shock absorber by utilizing an articulating top-plate to accommodate changes in the shock angle as the suspension moves. Making sure that the spring does not bow is essential in terms of maintaining spring rate linearity, shock absorber response, and long-term durability of the shock. Figure 5 above shows our articulating top-plates versus a competitor’s fixed upper top plates. At stock ride height the upper top-plate is perpendicular to the shock motion axis. But as we lower the car, or as the suspension moves during cornering or bumps, a misalignment angle develops between the shock axis, and the upper top-plate. Figure 6 illustrates what happens when a spring bows due to angular displacement of the shock absorber when upper top-plates are fixed. If we make a quick approximation of the amount of lateral loading experienced by the shock at full compression with a simple vector analysis, we can see that the shock can easily see lateral loads of up to 47lbs. Lateral loading restricts the movement of the shock piston and results in reduced sensitivity, and increased wear/deterioration of shock performance over time. (Note: In reality, a spring axis of force is not perfectly co-axial even when the upper and lower perches are aligned). Another contribution to lateral shock loading is the rubber mounted lower mount bushing used by our competitors. While we offer polyurethane lower shock mounts, we recommend that our customers retain the Aurora spherical bearings that are standard with our coilover kits. For most performance minded enthusiasts, the slight increase in noise over rough roads is easily worth the added performance benefit of the spherical bearing lower shock mounts. 4. Advantage of Using Dual Springs versus “Pre-loaded” Springs. 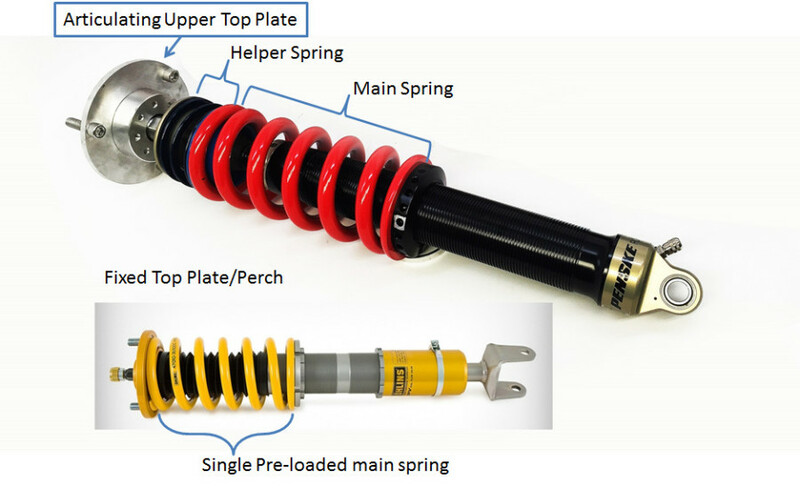 When designing height adjustable coilovers, there are two options: (1) Single preloaded spring with height adjustable lower collar, and what we use (2) Dual main & helper springs (see Figure 5). Pre-loaded coilovers are typically used for mass-market street applications because they allow use of a single shock body over a wide product range (since the shock body can be lengthened or shortened per the application rather than making many different length shocks). The other advantage of the pre-loaded setup for mass-market application is that it only requires 1 spring per shock, thereby saving cost of helper springs and spring couplers. The problem with pre-loaded coilovers is that as you increase the spring rates for reasons we outlined in Part 1, you reduce the suspension’s “droop” travel. Droop travel is defined as the distance that your wheel drops when your car is lifted. OEM suspension springs are typically pre-loaded, but they are very soft, so they maintain sufficient droop travel. Let’s take an example of an OEM suspension with 450lb spring versus an aftermarket high performance suspension with 900lb springs. If the sprung corner weight of the car is 900lbs, then we would expect that the OEM spring will compress 2 inches under the weight of the car, while the high performance suspension will compress about 1 inch. 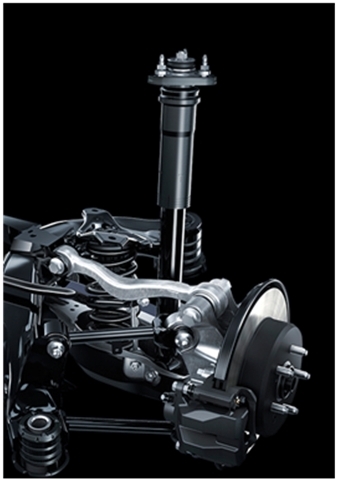 Consequently, the aftermarket suspension will have about ½ the droop travel of the OEM suspension. In reality, the suspension with 900lb pre-loaded springs will have less than 1” droop travel (measured at the shock) because some travel is taken up by the pre-load compression of the spring. All our coilovers use helper springs in addition to main springs. The helper spring has a relatively low spring rate, about 50-100lbs and is designed to allow the main spring to completely de-compress when the wheel is at full droop, without the main spring coming loose. In most cases, using helper springs increases droop about 1-1.5” over a pre-loaded single spring setup. Sufficient droop travel is critical to maintain stability and wheel contact with the road over large road bumps and track curbing. In some cases droop is so limited that wheels will actually lift under hard cornering as shown in Figure 6 below. 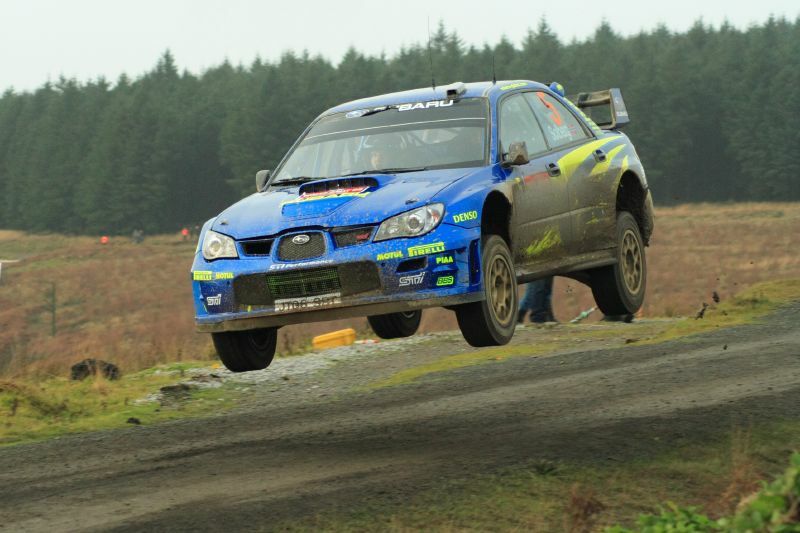 The bottom line is that a road car needs ample droop travel to maintain traction and stability over uneven roads, more than most aftermarket coilovers allow, but maybe not as much as the rally car in Figure 7! Figure 8: Example of “Extreme” droop travel in a WRC rally car! Unfortunately, in recent years, the coilover market has become saturated with cheap low cost imported coilovers. These coilovers have lots of features on paper, but ultimately do not come close to the performance achieved with the Penske 7500 series shock. To try to counteract the cheap coilover trend, certain Swedish, Japanese, and German companies market premium “road and track” coilovers. Unfortunately, their street offerings are actually designed around lower cost shocks which are colored the same as their uber-expensive racing products, but ultimately lack the standout design features that give them their racing reputation! The way we view it, it’s kind of like a “bait and switch” tactic…. but if you are in the market for a $3000 coilover, shouldn’t you get the real thing? The 7500 shock internals, from their piston design to their head valve are the same as used in their high end 8760 and 8780 championship winning racing products. The 7500 series shocks, while designed as a road & track offering, are actually raced in many forms of professional motorsports. Many professional racing teams can get imported “race” shocks for free, but they choose to buy Penskes. Penske shocks are 100% hand built and manufactured in the USA. Penske 7500 Series shocks are built in the same facility, and by the same techs who build IndyCAR, NASCAR, and all their race product – no “bait and switch” Psst… those “Swedish” road and track shocks are actually made in Thailand. Every Penske 7500 series shock is dyno tested after assembly. This ensures that every shock behaves precisely per the specification sheet – no mass production here. Durability and spares support: In the event of an accident or damage to your shock, the Penske Racing Shocks Headquarters in Reading, PA stocks ALL the spare parts necessary to rebuild and repair your shocks. With that kind of support, your shocks will outlast your car! 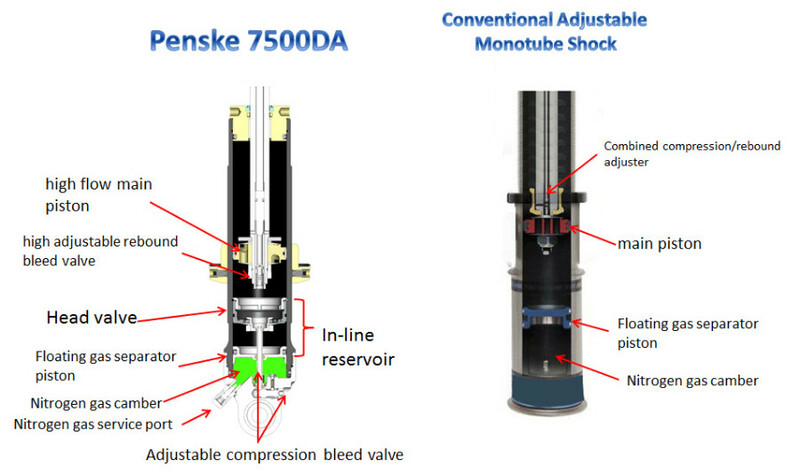 Penske 7500DA shocks offer independent compression and rebound adjustment. This feature is critical to perfectly dialing in your car for the track, or for street comfort. At RR-Racing we spec out our 7500DA shocks to custom lengths. Our completion uses a “stock” length shock with a threaded lower shock mount. By maximizing the lengths of our shocks, we increase the oil volume for improved durability and performance over a large temperature range. Penske shocks utilize a dual flow valve similar to other high end monotube shocks, but in addition to that, Penske shocks feature a unique head valve (see Figure 8) allows for reduced internal gas pressure. In a conventional monotube gas pressurized shock, high gas pressure is used in order to reduce aeration of the shock fluid, also known as “cavitation.” However, while gas pressure is beneficial in reducing cavitation, excess pressure can reduce the response time and sensitivity of the shock. The Penske 7500 shock is designed with a head valve and effectively acts as an inline dual reservoir shock. The head valve and inline reservoir design allow Penske engineers to use lower gas pressures for increased sensitivity, reduced internal friction, improved damping performance over a wider temperature range, improved durability, and reduced weight. This adjuster is typically used when looking to improve the car over bumps. If your vehicle is hitting a certain bump that is causing the vehicle to “unload” the tire, simply soften the compression adjustment. This will allow the shock to absorb the bump, there keeping the vehicle more stable and making the car more controllable. You can also use this adjuster to help in controlling the “platform” of the car, or the body roll. Example‐ If you are entering a corner and under braking the front of the car is diving to quickly or the weight being transferred from the back to the front is too much, simply close the compression adjuster on the front to slow that weight transfer down. The rebound adjuster is a great tool for tuning body roll. This is a much more driver sensitive adjustment than the compression. If you want to slow the pitch of your car from the back to the front, simply close the rebound off, this will slow the weight transfer. 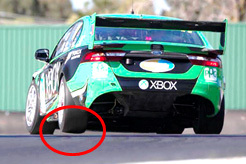 When you are accelerating off a corner, getting weight transfer to the rear tires is very important for grip or “forward bite” as its referred to sometime. By softening the front rebound, this will allow for quicker weight transfer to the rear tires, resulting is better rear grip. Be careful though, by allowing to much weight transfer to the rear, you may cause a loss of front grip, resulting in an “under steer” or “tight” condition. Important!! You can over adjust. Always have a baseline to go back to!!! Compression: Adjust 5 clicks at a time. Rebound: Adjust ¼ turn at time. Soften rear compression and stiffen rear rebound. Soften front rebound. This will allow your car to “squat” transferring traction to the rear wheels! RR Racing Makes History, Again! Modifying a Lexus Vs. a Subaru — Which Brand Comes On Top? New Tune for Lexus IS250 Released! Copyright © 2019 RR Racing, Inc. All Rights Reserved.